Focusing on travel in Muslim societies from Malaysia to West Africa to Western Europe from the first centuries of Islam to the present, the contributors to this edition investigate the role of religious doctrine in motivating travel. 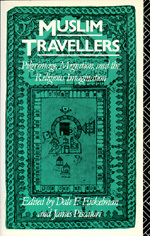 While pilgrimage is usually seen as travel with a uniquely religious purpose, this exploration of the role of travel in Muslim societies and in Islamic doctrine shows that other forms of travel—for learning, visits to shrines, exile, and labor migration—also shape the religious imagination. Conversely, travel for specifically religious purposes often has important economic and political consequences. The contributors explore the transnational and local significance of pilgrimage and migration, showing how these journeys heighten a universal sense of "being Muslim" while also inspiring the redefinition of the frontiers of sect, language, territory, and nation. In this way, encounters with Muslim "others" have been as important in shaping community self-definition as encounters with European "others." Linking pilgrimage and migration to issues such as class, ethnicity, and gender, Muslim Travellers will be of special value to students of history and anthropology and to those in cross-disciplinary courses such as Islamic civilization and world religions. Dale F. Eickelman is Ralph and Richard Lazarus Professor of Anthropology and Human Relations at Dartmouth College. James Piscatori is Senior Lecturer in Political Science at University College of Wales in Aberystwyth.